6,358 players started the 2007 WSOP Main Event on July 6th. Nine days, countless hours and innumerable energy drinks later, 36 players remained in the field. Sunday's Day Six required a grueling 16 hours of play to get from the 36 players down to a final nine, finally reached when Scotty Nguyen and Steven Garfinkle exited at the end of play. The nine survivors who will play for the Main event title on Tuesday are led by Philip Hilm, narrowly ahead of Tuan Lam and Jon Kalmar. Play got off to a raucous start, with three players heading to the rail on the very first hand. 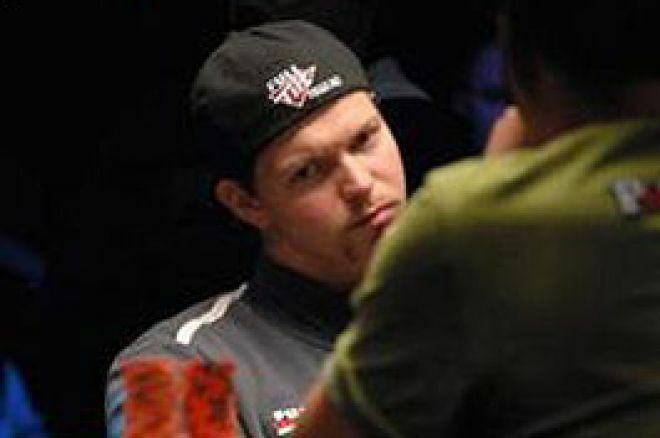 Robin Bergren moved all-in under the gun with his short stack and was called by Allan King. Roy Winston moved all-in over the top of King, and King called. Bergren's desperation move with ran into the for King and for Winston. The flop came down , and the turn and river completed Winston's full house to eliminate both players. While that carnage was happening, Hoa Nguyen raised from the button over on the featured table and was called by Lee Childs. The flop brought and Childs check-raised Nguyen. Nguyen went into the tank for a long time before he finally called. The turn brought the , and Nguyen called Childs' bet again. Childs checked the river , and went into the tank when Nguyen moved all-in. Childs finally called, and Nguyen showed for two pair. Childs tabled for a higher two pair, and Hoa Nguyen exited in 34th. Christian Togsverd (33rd), Kevin Kim (32nd), Peter Darvill (31st) and Jason Koshi (30th) all went to the rail early in the day as play crept toward three tables. Scott Freeman made a good read on Ron Kluber to eliminate Kluber from the tournament in 29th. After both players checked the flop of , Kluber pushed all-in on the turn . "Why would you put 2.8 million in that pot?" Freeman mused; Kluber's move was a sizeable overbet. Freeman though for a while and called with , dominating Kluber's . The river brought the and Kluber was eliminated. Paulo Loureiro was the last to be eliminated before the redraw for three tables, running his pocket kings into Hevad 'Rain' Khan's pocket aces. The board came , and Loureiro was eliminated in 28th. Jeff Bryan was the first to fall in three-table play, pushing all-in over the top of Philip Hilm's preflop raise. Hilm called quickly with and Bryan's was behind. The flop of helped neither player, but Bryan took the lead on the turn of . Hilm re-outdrew Bryan when the river brought the , giving Bryan two pair, but filling Hilm's Broadway straight. Roy Winston (26th), Daniel Alai (25th) and Ryan Elson (24th) went out in fairly short order as play pushed on into the late afternoon. Bill Edler was one of two players eligible to become multiple 2007 bracelet winners when the day started, but his quest ended in 23rd place. Edler, winner of Event #45, open-pushed from late position with , and was eliminated by Jerry Yang's on a final board of -x. Edler, well known as one of the true gentlemen of the game, was eliminated in 23rd. John Armbrust busted soon after the redraw, courtesy of Lee Childs. Armbrust raised pre-flop from the big blind, and then pushed all-in over the top of Childs' limp-raise move. Childs spent several minutes evaluating his stack and the impact of the call before shoving his chips in with . Armbrust was a dominant favorite with , but the flop brought , giving Childs outs to the nut flush. The turn brought the , and Armbrust was drawing dead. The was irrelevant on the river, as Armbrust was eliminated in 18th. Alex Kravchenko was the only 2007 bracelet winner left in the field, and he put all his chips in the middle early in two-table play. Kenny Tran called from the small blind and Kevin Farry called all-in from the big blind. Kravchenko tabled versus Tran's and Farrys' . The board ran out and Kravchenko tripled up while Farry was eliminated in 17th. Kenny Tran lost about two million in chips on that hand, and was the next player sent to the rail when Jon Kalmar rivered a nut flush to bust Tran in 16th. Bob Slezak (15th) and David Tran (14th) went to the rail from the featured table, then William Spadea ran his into Jon Kalmer's pocket aces to depart in 13th place. The flop gave Kalmer a flopped full house. Scotty Nguyen won a coinflip to eliminate Ray Henson in 12th place and double up, bit then ran a flush draw into Philip Hilm's top pair on the flop and didn't hit. Nguyen pushed all-in on the flop of , and Hilm called with . Nguyen was behind with , and only a club or running cards could keep him in the tournament. The turn card was the , and the sent the 1998 World Champion out in 11th place, guaranteeing a new Main Event winner. It took 36 hands and over two hours to eliminate that last player. Finally, Steven Garfinkle, the shortest stack at the final table after Kravchenko's early double-up, moved all-in from middle position. Raymond Rahme called from the small blind and revealed , well ahead of Garfinkle's . When the flop brought the , Rahme made a set of queens, but Garfinkle actually increased his outs, as any ten made his straight. Rahme dodged Garfinkle's outs, and Steven Garfinkle was the final-table bubble boy, finishing in tenth.